I'm trying to learn how to use UICollectionView. The documentation is a little hard to understand and the tutorials that I found were either in Objective C or long complicated projects. 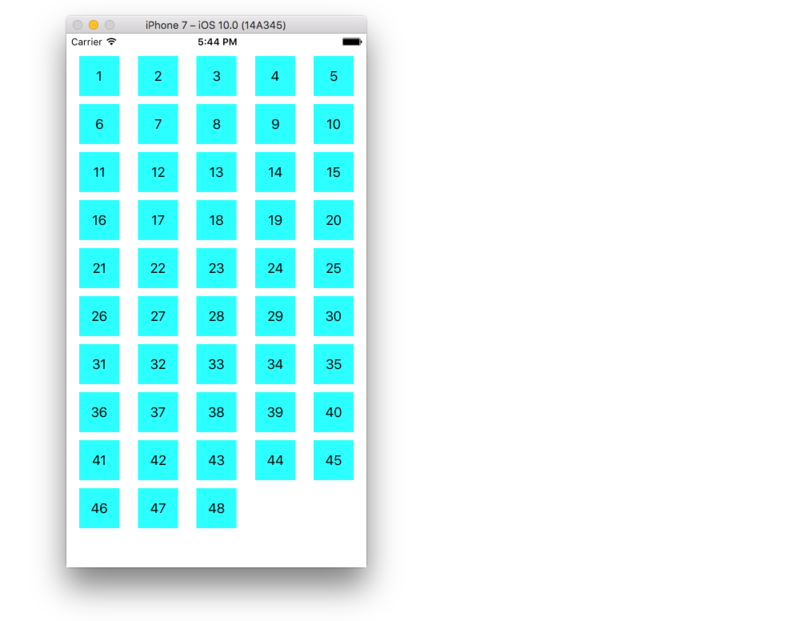 When I was learning how to use UITableView, We ❤ Swift's How to make a simple tableview with iOS 8 and Swift had a very basic setup and explanation to get me going. Is there anything like this for UICollectionView? The answer below is my attempt to learn to do this. In the Interface Builder, go to your Collection View > Attributes Inspector > View > Background. Changing the minimum spacing between cells to a smaller value makes it look better. In the Interface Builder, go to your Collection View > Size Inspector > Min Spacing and make the values smaller. "For cells" is the horizontal distance and "For lines" is the vertical distance. If you want rounded corners, a border, and the like, you can play around with the cell layer. Here is some sample code. You would put it directly after cell.backgroundColor = UIColor.cyan in code above. See this answer for other things you can do with the layer (shadow, for example). If you didn't hook up the outlet by control-dragging from the label in the storyboard to the @IBOutlet for myLabel in code, you would get a crash like this. @JamesG, Don't use the View Controller. Select the MyCollectionViewCell class code. Control drag from the label in the Interface builder to the myLabel outlet in the code. Remember that the default backgroundColor of UICollectionView is black. @AnnabelleSykes, the default background color for me used to be black when I was making this project in Xcode 7, but most recently when I retested the project in Xcode 8, the default was white. Anyway, whatever the default is for you, it can be changed in the Interface Builder or in code. Is it possible to build a static collection view entirely in the Storyboard, similar to how you can build a table view with static content? With static content table view you can completely avoid using cellForRowAtIndexPath:, I was wondering it it's possible to get away without implementing cellForItemAtIndexPath: for my collection view. @IlyaVinogradov, I've never done this and a survey of other SO questions seems to indicate that it is not possible (see here and here). I hope the moderators save this q/a. It's terrific. Suragch example is a great little example to get started! @suragch thank you so much for this! Question - I have a function dynamically creating the data array... how can I call reloadData() for the uicollectionview from my data function? @andehlu, I haven't been working with this for a while so I can't remember very well. Off hand I would say load the data in a background thread and when it completes then update the UI with reloadData(). It that doesn't work try asking a new question. Cells will repeat if we add more than visible cells. E.g., if I add 1000 in array and try to load in the collection view. While scrolling the collection view, the cells will be repeated. I know its because of reusable identifier, if we want to keep dynamic reuse identifier, then we need to register all reuse identifiers in viewDidLoad and also we have to separate customer cell XIB from storyboard. That look little odd and I feel its not a standard. Do we have any alternate to that solution? @SrinivasG, You mean that you made the items array go from 1 to 1000 (["1", "2", ... "999", "1000"]) but it repeated the first screen of numbers (1~70 or so)? I'll make a note to retest this, but if you want a quicker answer you might ask a new question on Stack Overflow. @Suragch Thanks for checking it out. Yes, the cells will be repeating if custom cell of collection view embedded in storyboard. We were able to get it working properly if the custom cell separated from storyboard as new UICollectionViewCell xib and register dynamic reuse identifiers in viewDidLoad, but that looks odd in registering all identifiers. Thanks for this. Its a great tutorial. It's working perfectly but I'm a tiny bit confused on how it works? The same function "func collectionView" exists 3 times. How does it know which function to run? Sorry, I was looking at it more and think I get it now. When you, for example, link the collection views data source to the file then it looks in there and expects to find at least its mandatory methods (which it tells apart by the parameters)? @GeorgeKendros, that is correct. Those are the mandatory methods for the data source and delegate protocols. It tells them apart by the parameters. @SrinivasG, I finally got around to testing this. I made the array ["1", "2", ... "99", "100"] so that it scrolled off screen. Everything seemed to work fine. The cells didn't repeat for me. I didn't change anything else about the project besides the data array. 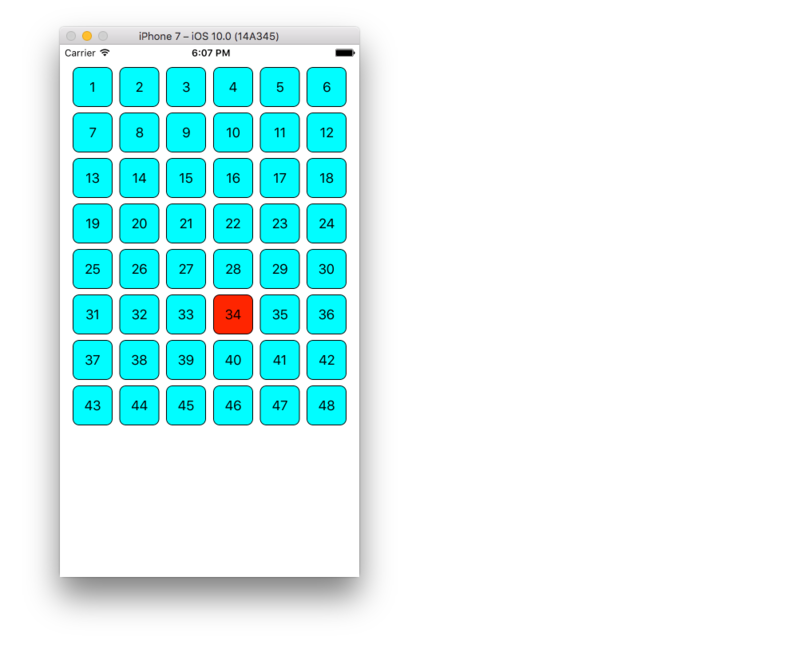 UICollectionView is same as UITableView but it gives us the additional functionality of simply creating a grid view, which is a bit problematic in UITableView. It will be a very long post I mention a link from where you will get everything in simple steps. [SOLVED] How do I make an attributed string using Swift?